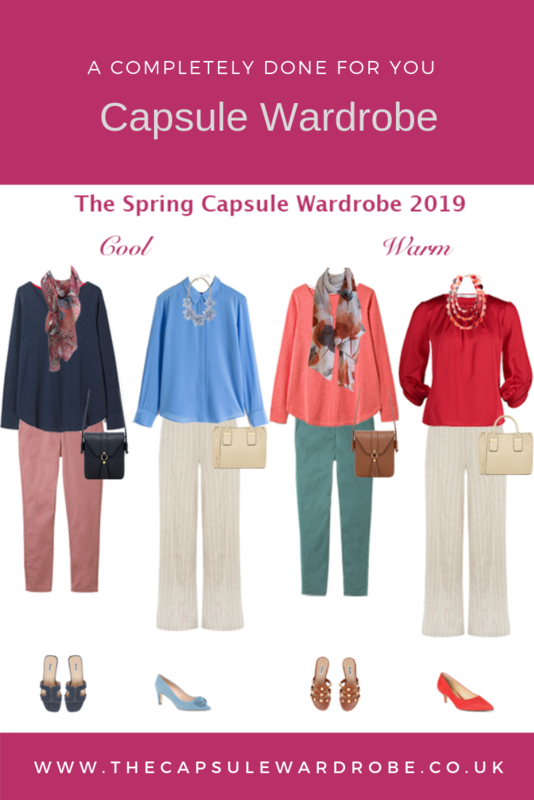 A done for you Capsule Wardrobe for Spring including casual, smart casual and some more dressy outfits. A digital booklet containing 2 complete capsule wardrobes, one for cool skin tones and one for warm skin tones. The booklet contains 28 unique outfits for each colour way, 56 outfits in total. There are casual, smart casual and some more dressy outfits for evenings or events. All styled with accessories, so all you need to do is click the links to buy the items and copy the outfit combinations. All the pieces included in the capsules have links directly to purchase the item. You can of course substitute them with similar pieces you already have, using the outfits I have created for inspiration. When you order, you will be sent a link to a page containing the capsule. All the individual items are shown with links to buy them as well as all the outfit ideas. All the hard work of finding the items and creating outfits is done for you, including all accessories. All of this for just £39 – less than the cost of a top and saving you so much time and money on costly mistakes! You will never wonder what to wear again. Buy the Spring Capsule 2019 Now!